When puppies are born at true shot, its a big event! Months of planning and preparation all come to ahead when the special day finally arrives and mother nature again bestows upon us the miracle that is a litter of tiny newborn chihuahuas. A rule of thumb with training a chihuahua is start early! Its hard to do that if you don't even meet your dog until he is 8, 10, 12 weeks old! Therefore that responsibility belongs to your breeder, a responsibility I take seriously. True shot puppies are raised in an environment built to provide the best foundation possible to young dogs to ensure they have the best start at becoming a well behaved, well socialized, and well loved companion. More to come on puppy training at True Shot Chihuahuas! 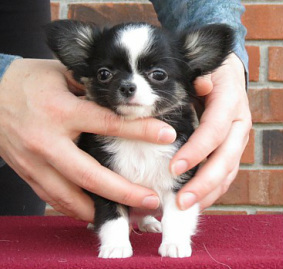 Call today for more information on puppy training at True Shot Chihuahuas!